Sized for eye-catching impact, the PN-R903A LCD monitor features a towering 90-inch screen large enough to realistically showcase life-size images of people. This top-quality LCD colossus excels in a variety of indoor venues, including retail locations, educational institutes, conference rooms, and public spaces. Incorporating a single, seamless screen, the PN-R903A can make an unforgettable impact on any audience. 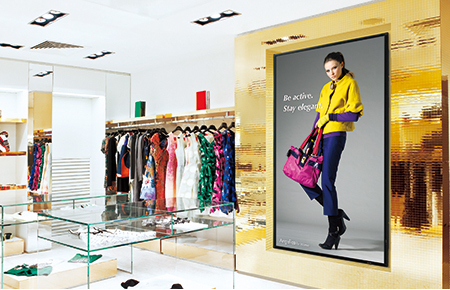 The 90-inch LCD panel incorporates Sharp’s UV2A* technology, which ensures highly efficient use of light from the backlight and prevents light leakage. The result: truly bright whites and extremely deep blacks. The panel also boasts a full-array LED backlight, in which LED elements are evenly positioned across the entire panel to give on-screen images remarkably uniform brightness. * UV2A stands for Ultraviolet-induced Multi-domain Vertical Alignment, a photo-alignment technology that ensures uniform alignment of liquid crystal molecules. The PN-R903A offers a choice of landscape or portrait installation, allowing customers to select the mode that best suits their display content and application. While portrait installation offers the look and impact of a poster, landscape installation puts wide images on vivid display. Built solid, the PN-R903A is ideal for use in 24-hour stores and in other demanding professional applications that require around-the-clock operation seven days a week. Multiple monitors can be grouped together to display one enlarged image, thanks to Enlarge (Zoom) Display mode, which corrects the framing of that image to eliminate misalignment between monitors. With Mirror Display mode, the same image can be displayed on a daisy chain of the PN-R903A for the powerful impact of visual repetition. 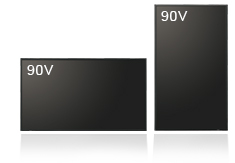 * The number of monitors possible in a daisy chain varies depending on the connection method: Up to 25 (for non-HDCP-encoded content) or 4 (for HDCP-encoded content) via DisplayPort™; or up to 5 (for HDCP-encoded content) via DVI. Built-in speakers eliminate the need for external speakers and keep the PN-R903A stylishly streamlined. The speakers emit sound from both sides of the monitors, making them ideal for conveying audio information and playing location-appropriate background music. VESA-compliant mounts provide right/left pivot and swivel, ensuring a high level of safety when these LCD monitors are mounted on a wall or suspended from a ceiling. Thanks to an RS-232C interface, the LCD monitors can be easily controlled and monitored from a central location via a PC. Each monitor can be assigned an individual ID code to specify when remotely turning that monitor on or off, changing its input, or making various screen adjustments and settings. With the E-Mail Notification function, display status updates will be sent periodically to a specified e-mail address. A notice will also be sent if a malfunction occurs. Sharp LCD monitors can be easily operated through a Web browser and monitor control software*.